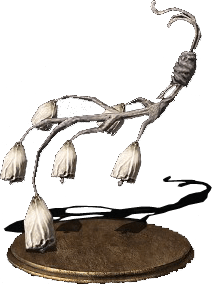 Saint-tree Bellvine is a Chime in Dark Souls 3. Sacred chime for casting miracles of the Gods. A bellvine cut from a small saint-tree that has been meticulously tended to. Saint-tree bellvines are customary in the far north, and allow for faster casting than ordinary sacred chimes. Recovers HP for a period of time, albeit extremely slowly. Works while equipped in either hand. Buff applies for all spells you cast from all schools, even those cast with another catalyst in your other active slot. Buff only applies while Saint Tree Bellvine is in an active slot (ie. in your hand or on your hip). High casting speed and low spellbuff make this ideal for miracles that do not scale with spellbuff. eg. Replenishment, Blessed Weapon, Deep Protection, and Sacred Oath. Like all Chimes, it can be dropped in Picklepee the Crow's nest to receive the Help Me Carving item. Looted from a tree stump in Cathedral of the Deep, close to the bonefire. Exit the chapel through the entrance, turn right where 4 hollows are praying infront of an Estus Shard, and drop down into the water with the prowling maggots. The tree stump can be found outside to the left, just behind the building with the ladder shortcut. So is 50 virtual dex gives the maximum cast speed or its just very marginal increase for 50+? Best chime for offensive skills until you get +2 sage ring so you can go for saint or yorshka. effects sorcery spell cast time as well! Guys, there seems to be another passive buff that even further tips the scales on whether or not you should use this! It takes less stamina to cast miracles! If i use my yorshka&apos;s chime, casting projected heal takes all my stamina, using this i have just enough stamina to cast 2 in a row or roll out. does it stack with the sage ring? This work like sage ring +2, equip it in off hand provide you ~ 40 virtual dexterity, which is very good for a Caster build. =>>This free up a ring slot. Probably should mention the synergy that Dorthy&apos;s Gnawing has with the Bellvine chime. Given how negligible damage the spell deals, the main focus will be the bleed buildup - which of course will be fantastic to pair with a faster casting speed. Contrary to what this wiki page states, I do not believe the speed buff applies if this is worn on hip. Based on my speed tests, it has to be held in (either) hand. Not noticing a faster speed for Corona. Yes, I know it&apos;s not a great spell, but it&apos;s a pure roleplay one. So this works when equipped in a slot for miracles, too, freeing a slot for a ring other than the sage ring? Updated spellbuff vs faith, casting speed buff = sage +2, video proof provided, also some rewording. i Have a question, if i want to use this chime only to have high speed casting to buff spells that dont scale or scale bad with spell power and i have 15 faith (i needs 18 fth for the chime) will affect the speed? or only the spell power? if is only the spell power then i will stay at 15 instead of 18, that would save me 3 points. please someone knows? Will this cast gentle prayer (the special ability) any faster than a normal chime? This vs Sage Ring +2, can we get an actual numbers comparison somehow? I&apos;m not sure if anyone has ever mentioned this, but the passive speed increase for casting seems to effect other chimes/talismans/weapons on hand that can cast miracles. I noticed this when I went to go test out how fast it casts compared to other chimes/talismans, so I had the Bellvine in one hand and the Rose of Ariandel in the other. For some reason, they casted miracles with the same speed. Switching away the Bellvine, the cast time for miracles with just the Rose took longer to pull off until I re-equipped the Bellvine in my offhand. Excellent catalyst for Blessed Weapon just like the page says, used this against Dragonslayer Armour when there&apos;s no point in using Lightning Weapon and there&apos;s not much time for buffing. Saint-Tree Bellvine Buffs the speed of the catalyst in the opposite hand. Fun fact. So you can rock a Yorshka&apos;s Chime with the speed of a high dex character without the need for the sage ring or actual dex. What little power does it have at +10 with 60 fth? Since their Bleed buildup is not associated with Faith or spell power, it can be ideal to use this Miracle, too. Does the art Gentle Prayer scale from Faith or upgrade level of this chime?